all of a sudden the machine developed a strange malfunction: the Uher had problems with its engine. Himmelgeist was born. The recorder began to ‘scratch’ like a vinyl record, but it was the recorder doing everything itself; we could also manipulate the speed with our hands. This was magnificent. Strange rhythms just happened, the tape recorder did it… We are thankful that we managed to record all of this. 3. We often amplify sounds quite loudly, that actually have a very low natural dynamic. This is interesting when recording guitar, piano and the human voice… To reduce the normal recording level by an extreme and amplify the soft, low sounds. 5.5 – Veteran sound creators Strafe F.R (“Strafe Für Rebellion”) have existed since 1979, with a sporadic release pattern. Their music exists on the boundary between industrial and musique concrete/avant-garde. The Bird Was Stolen is their first album since Sulphur Spring in 2014. This is my first exposure to the group’s music. The album has the rapid, gestural quality of musique concrete, in the sense that there is a series of sounds in succession rather than any kind of meter. Many brief glimpses appear and quickly go, possessing unique timbres and brief melodic ideas. This fragmentary structure is also used in Nurse With Wound’s most haunted classic works, Homotopy to Marie or Spiral Insana, one of the closest comparisons to the sound of this album. Generally, The Bird Was Stolen feels more live and filled with punky aggression than NWW’s solitary studio creations, and denser with sonic activity. While there is no conventional guitar playing per se, grimy swells of amplifier distortion are used to sketch dim nocturnal and subterranean environments. Clearly doom metal influenced tones date this as a current creation amidst the call-backs to vintage industrial music. Several of the tracks feature emphatic, theatrical narrations with heavy effects processing. It is a rare, more ambient flavour of ‘power electronics’ as created by Coil. It is not unlike some of the more abstract improvisations by Throbbing Gristle (such as “Kreeme Horne”); in the way it will sway and bob in marshy disrepair, movements heat-addled and lazy, only for the calm to be punctured now and again by a distorted wail. The texture is unmistakably analogue, from the beefy low-mids of the gated noise oscillators in “Pianosmoke”, to the various examples of tape looping/manipulation and dub delay. This group has been especially inventive and focused with these vintage techniques and machines. The modular synth work has a particular visionary impact, particularly in the secound half of the album with songs like “Medusa”. As a huge fan of Coil and albums like Worship the Glitch, this album feels like a lost work from the past, and it’s wonderful to hear quality new music being created in this niche. 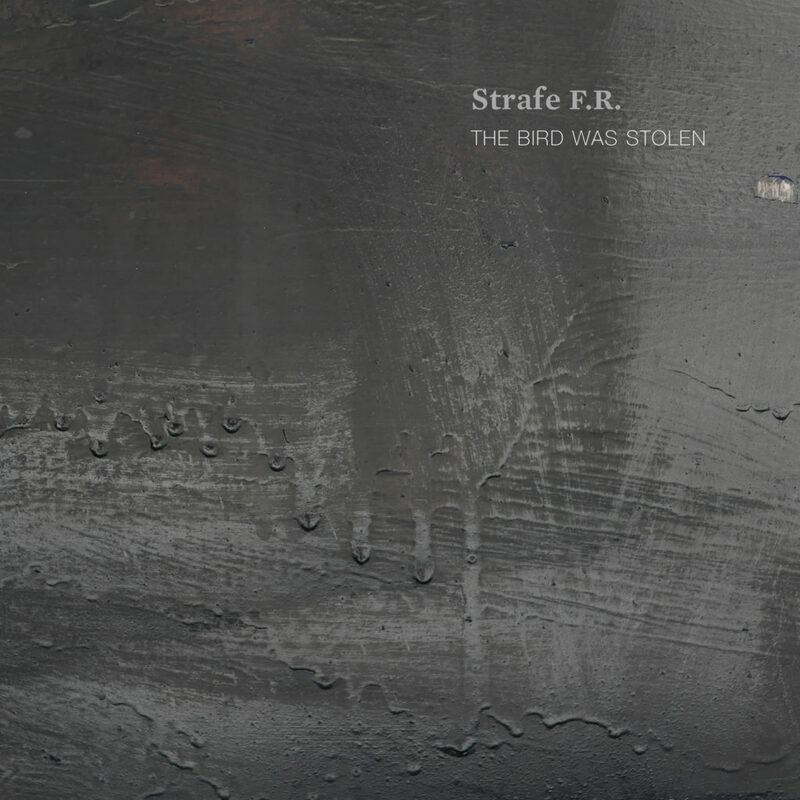 Long-running German duo Strafe F.R. has been at it since way back in ’79 and The Bird Was Stolen is their first recording on Touch since four releases between the 80’s and early 90’s. Next week (5/24) Bernd Kastner and Siegfried Michail Syniuga unveil this new album in an edition of 500 on CD (and Digital) with fourteen tracks, and a running time of just over an hour. As Jovian Tempest opens we enter a bit of a sacred and mysterious space. What sounds like radio channeling pairs well with other frequencies and effects. It’s definitely in a gray area and I recommend that you may want to listen in the dark. Indistinguishable field recordings of moving elements are embedded with exquisite corpse harmonies on Prepper’s Home where rhythmic percussion rises into the mix. It’s warming and pent up until a remodeled voice emerges on Aconite accompanied by charged guitar and fiery electronics. Alles begann mit einem Adler, heißt es. Der aß von der Leber des Prometheus, der an eine Felswand des Kaukasus gekettet wurde, weil er den Menschen das Feuer gebracht hat – was ihm strikt verboten war … So die Legende des ersten Rebellen, dessen Strafe das Anketten war. Und schon sind wir beim Thema. STRAFE FÜR REBELLION, beziehungsweise STRAFE F.R. heißt dieses lang bestehende Projekt aus Düsseldorf, das bereits 1979 von BERND KASTNER und SIEGFRIED M. SYNIUGA gegründet wurde. Ihre erste selbstbetitelte LP, der eine 7inch beigelegt war, erschien 1982. Viel Beachtung wurde ihr aber leider nicht zuteil. Obwohl doch die 1980er- und 1990er-Jahre durchaus produktiv waren. Dann kam die Pause. Sie dauerte etwa zehn Jahre. Erst 2014 knüpfte STRAFE F.R. an das Musikalische der vergangenen Jahrzehnte an. 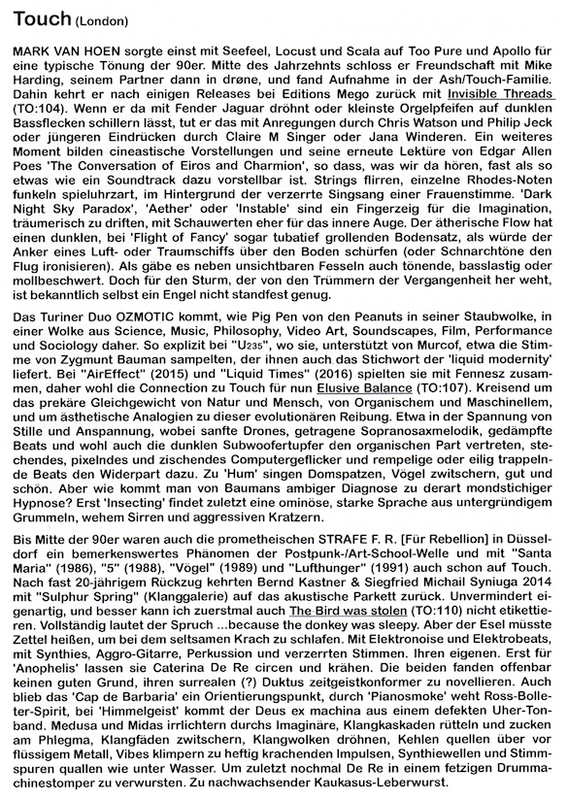 Doch nun gibt es mit “The Bird Was Stolen” eine brandneue, auf 500 Stück limitierte und auf dem Label TOUCH herausgegebene CD. Es entstehen durch Arbeit stark entfremdete Sounds, die nichts mehr mit der eigentlichen Klangqualität gemein haben. 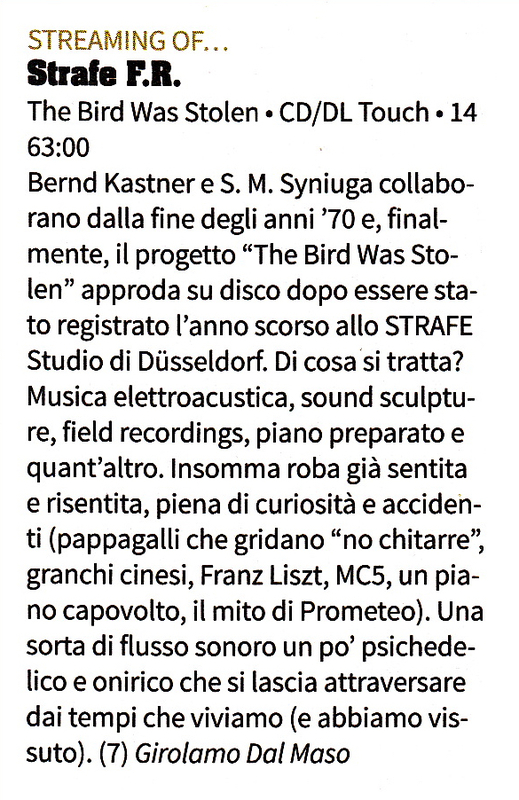 In “The Bird Was Stolen” sägen Gitarren, klappern metallisch klingende Gegenstände, wabern unzählige Fäden, die zeitlich immer weiter ausfransen. Auf „Pepper´s Home“ (02) etwa ein Schlagwerk, das sich wie von einer defekten Maschine gespielt anhört, die auf wundersame Weise jedoch noch den Takt halten kann. Und Flächen, die hier und da wie Schollen vom Grund und Boden abbrechen. „Aconite“ (03) steht ebenfalls stellvertretend für diesen speziellen STRAFE F.R.-Sound. Attivo dal 1979 (con una pausa produttiva da metà anni novanta sino al 2014), il duo Strafe F. R. (abbreviazione del più esteso Strafe Für Rebellion) formato da Bernd Kastner e Sigfried Michail Syniuga, torna a farsi sentire con quest’ottimo “The Bird Was Stolen” che segue il loro ritorno sulle scene “Sulphur Spring”. Un suono alieno di questi tempi, che raschia e ingloba ruggini, lamiere, distorsioni, voci e vocine (spappolate, tritate e stirate), ritmi sghembi e strumentazione homemade, fiati e sfiati, corde in azione trasfigurante, registrazioni d’ambiente, nastri e un certosino lavoro di taglia e cuci in fase post. Materia ondivaga che inquieta e non s’addomestica come carta da parati acustica. Apron delle porte che probabilmente non interesseranno più a molti, ma attenzione, perché il colpo d’occhio offerto, è unico nel suo genere (quasi da sacred music tipo Factrix per intenderci, ma con minor tasso ansiogeno).